Gayasan Mountain (가야산) in Gyeongsangbuk-do was designated as a national park in 1972. Chilbulbong Peak towers at 1,433 meters. It borders Seongju-gun, Hapcheon-gun and Geochang-gun. In particular, Suryun-myeon, Seongju-gun is famous for its scenic nature. Furthermore, the beautiful Gayasan Drive, which extends from Suryun-myeon to Gayasan Mountain, highlights the splendor and grandeur of the precipitous crimson cliffs. The drive also offers the humble beauty of the rolling mountain, while the beautiful trails along the valley and nearby waterfall are fascinating as well. In Baegundong area, you will encounter Beopjusa Temple. This temple was built during the Silla period and is said to have been a huge temple consisting of approximately 100 chambers. Now, only a stupa, cornerstones, and flagpole supports remain. 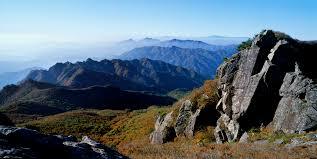 Yonggigol Valley offers a scenic mountain trail along which you can enjoy the stunning beauty of Gayasan Mountain.